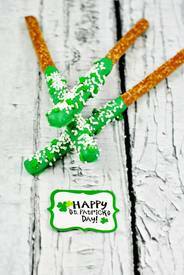 PATRICK'S DAY CHOCOLATE DIPPED PRETZEL RODS! If you have little ones, these St. Patrick’s Day Chocolate Coated Pretzel Rods are a great way to get your kids in the kitchen so that you can spend a little quality time together. You can have them dip the pretzel rods into the chocolate or even just add the sprinkles. I think treats just taste better when our kids have helped us make them, what do you think?